About Weimaraner Puppies " "
Weimaraner puppies are very adorable with many distinguished and good looking features. They have a long head that is equipped with a muzzle and skull that is of equal length. The muzzle has a moderate stop, and the Weimaraner has a gray nose and a perfect scissor bite. The Weimaraner has a very handsome silhouette. The ears of Weimaraner puppies are long and floppy. However, even though he has long ears, they do not obstruct his hearing, which is by far one of the breed’s better developed senses. This is what makes him such an alert watchdog. The eyes of Weimaraner puppies are their most distinctive feature. Their eyes are very intense and come in shades of light gray, blue-gray and light amber. Their eyes convey an alert and bold expression. You will find that when they become excited their eyes will dilate and appear almost entirely black. The body of the Weimaraner is strong. The body is of a moderate length and is very straight. They have a well developed and deep chest. Their ribs are long and well sprung. The body extends into the tail which should be docked when the Weimaraner puppies are the right age. When the Weimaraner matures, his docked tail should measure to 6 inches. This breed carries his tail with confidence and pride. As you observe the body of the puppy, turn you gaze towards their four legs. The front legs should appear strong and straight. The back legs are muscular and have stifles that are well angulated and hocks that are straight. The feet of the Weimaraner are their other main distinctive feature because the feet are webbed. Their toes are well arched and are equipped with thick pads. The feet of the Weimaraner are what make them powerful swimmers. 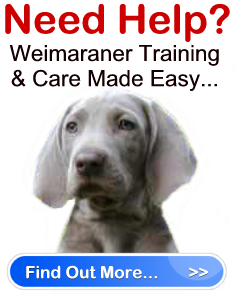 Weimaraner puppies are available in both long haired and short haired varieties. However, the short haired Weimaraner is the more popular and common of the two. That being the case, the Weimaraner has a short, smooth and fine coat. The color of the coat is gray. The breed can come in different shades of gray that range from mousey gray to silver. The body of the dog is one color except for the head and the ears which is a slightly lighter shade of gray. All of these characteristics, also known as the breed standard, provide Weimaraner puppies with their intriguing and unique appearance. Should you have any concerns about a puppy’s appearance, you should ask the breeder to see the dam and sire of the liter to compare them to the breed standard.